ST PETERSBURG, Russia -- Russia may toughen its response to sanctions imposed by the European Union over the crisis in Ukraine if the bloc extends its measures against Moscow, a Kremlin aide said on Thursday. 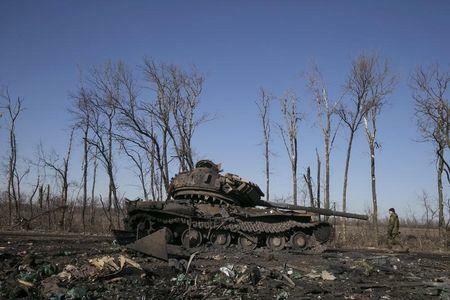 A fighter with the separatist self-proclaimed Donetsk People's Republic army looks at a destroyed Ukrainian army tank near the town of Debaltseve. Economic adviser Andrei Belousov's comments, at the annual St Petersburg International Economic Forum, followed a decision on Wednesday by EU governments to extend the economic sanctions on Russia until the end of January, 2016. "We are looking at a wide range of actions. I don't want now to name the measures that could be taken. Much will depend on what decision the EU takes," Belousov told reporters. Asked whether Russia could toughen its counter-sanctions, which include a ban on Western food imports and travel bans on European officials, Belousov said: "I rule nothing out." Russian officials have said Moscow will wait for a formal EU decision before taking any steps but that the extension of sanctions would be harmful for the EU as well as Russia. The sanctions imposed by the EU and the United States over the conflict in Ukraine have deepened problems for Russia's economy, also hit by a fall in global oil prices and the ruble's fall against the U.S. dollar. Sanctions were initially imposed after Russia annexed the Crimea peninsula in March last year. Western government also say Russia has sent soldiers and arms to help separatists fighting in east Ukraine but Moscow denies the accusations. Economy Minister Alexei Ulyukayev said earlier on Thursday that Russia was unlikely to introduce new measures in response to the extension of EU sanctions but was likely to extend the food embargo. "We will just keep the status quo," he told Russia's RIA news agency.